Everyone knows that veggies are indispensable to optimal health. They are loaded with fiber, antioxidants, and vitamins. They also help with calorie reduction. However, eating salads every day isn’t appealing to most. Here’s 8 sly ways to smuggle in more veggies – for yourself and your kids. 1) Beets are a rich source of antioxidants and nutrients, including magnesium, potassium and vitamin C. Cook and puree your beets and bake them into snacks like brownies. They are naturally sweet and the “beety” taste will be disguised. They also naturally add needed moisture to your brownies. 2) Zucchini contain useful amounts of folate, potassium and vitamin A. Peel 2 or 3 and cut them into long, thin, spaghetti-like strips. Add them to your spaghetti in the last 2 minutes of boiling. 3) Mushrooms are an excellent source of B vitamins like riboflavin and niacin. They also provide potassium, selenium, and copper. Most people today want to cut back their consumption of beef and other meats. Replace 25 – 50% of the ground meat in burgers or meat loaf with finely chopped mushrooms. The moisture will be enhanced and you save amply on fat and calories. 4) Cauliflower is rich in fiber, folate, vitamin C and is considered to possess high nutritional density. Steam cauliflower florets and blend in a food processor with salt, black pepper, thyme, olive oil and paprika. Mix in with your regular mashed potatoes. 5) Broccoli is loaded with fiber, vitamin C and contains nutrients that have proven anti-cancer properties. Enhance your sandwich spread by placing defrosted broccoli florets in a food processor with regular or low-fat mayonnaise. Spice up the flavor with your choice of mustard, basil, garlic or lemon juice. 6) Pumpkins are rich in beta-carotene, potassium, and vitamin A. Make yourself pumpkin puree and top off your morning porridge. Or stir it in for an orange texture. 7) Red peppers contain far more vitamins and nutrients than green peppers. 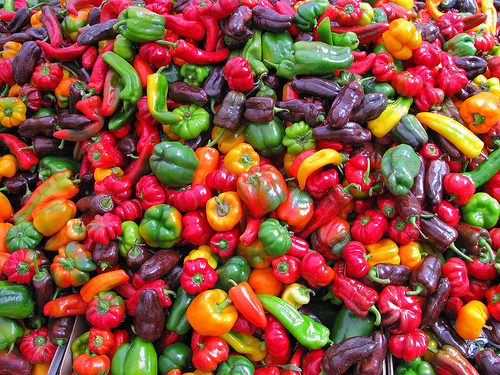 The average red bell pepper has 3 times more vitamin C than a regular orange. Make your own vinaigrette by blending roasted red sweet peppers, olive oil, red wine vinegar, and garlic. 8) Spinach and kale are super foods. Spinach is rich in several vitamins, magnesium, iron, folic acid, zinc and omega-3 fatty acids. Kale is high in calcium, vitamins C and K, and beta carotene. Blend them into any smoothie. They are a perfect mix with Greek yogurt and berries.